Moving over here, one of the things I was worried I would miss were pumpkins in the fall. You can imagine my relief when I found out that pumpkins are as synomous with Fall in Germany as they are in the States. Even better is that you can get pumpkin spice lattes at Starbucks over here. Although I firmly believe that they should not be consumed until the official start of fall, much like Christmas music should not be played until AFTER Thanksgiving. 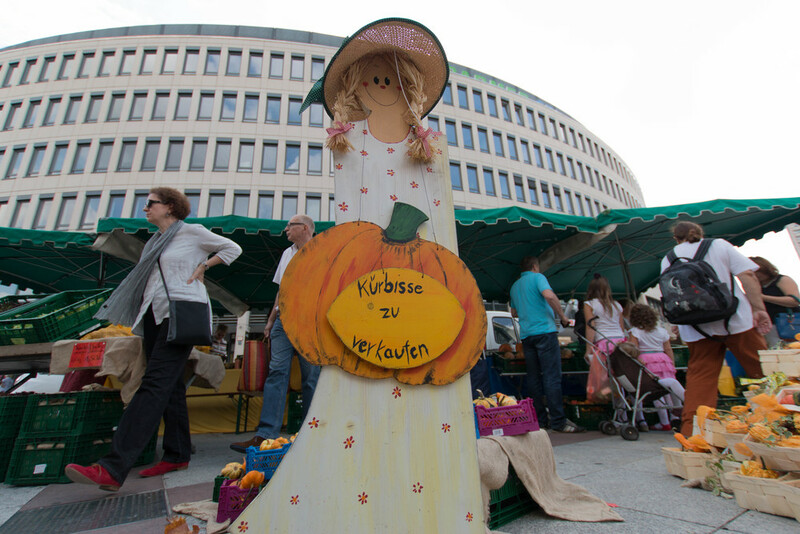 This weeked, the city of Ludwigshafen held a Kurbismarkt (Pumpkin Market) to welcome Herbst (Autumn). We went over to check it out and even managed to figure out the tram so that we didn't have to drive! The thing I've noticed about the weekly markets over here is that the produce is usually pretty cheap. We got a bag of squash (two Hakido, two Butternut, a spaghetti and a couple others) for 3.50 Euro. And they are perfectly sized for two of us (which in the US is very hard to come by with our GIANT squash). There were a couple of food vendors there as well. One was selling pumpkin wurst, which were just as good as they sound! The market was on the small side, given the amount of advertising that we saw, but they did have a couple of older tractors on display along with some giant pumpkins. 15 pounds of squash later, we headed home to drop off the squash before heading out to Bad Durkheim for the real star of the day - the Durkheim Wurstmarkt! Don't ask me why it's called a Sausage Market since it's a wine festival. Again, we took the tram. Thanks to the daily tickets available to purchase, it cost just over 15 euro to ride the tram all day. Pretty good deal when you think about gas and parking fees. Also, this way both of us could enjoy the wine festival and still get home. And enjoy the festival we did! 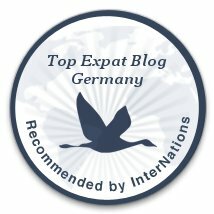 The Germans appear to greatly enjoy their wine festivals. There seems to be one every other weekend. Their called wine festivals, but they are a little heavier on the festival than on the wine. But that's not to say there isn't any wine, or that it's hard to find. There was an area set up that had a bunch of wineries with their own station. We grabbed a halbtrocken (off dry) Riesling at one of them, and walked around a bit to see some more of the festival. An interesting thing over here is that disposable containers, plates and cups are rarely seen. Almost always, food and drink are served in real dishes. Usually, the glasses incur a pfand (deposit) which is anywhere from 1 - 2 euro. When you finish your drink, you take the glass back and get your pfand back. I wish this practice would take off more in the US. I so much prefer to drink my wine of our a real glass than a plastic one (said while hold a wine glass with my pinky in the air). One glass of wine down, we headed over the BIG tent. There was a stage, with a band playing, and they were pretty good. Most of the songs were German. I can't tell if the songs were more traditional or more current, but everyone was singing along. They did play a few English songs; one of them was John Denver's Country Roads. Of course, being one of the few songs we did know, we sang along (thanks Mom for listening to John Denver when I was younger!). Even more amazing, ALL the Germans knew the song! It was in this tent that the REAL debauchery happened! Man, do those Germans know how to party! There was a group of men, all dressed in lederhosen, drinking, and dancing and singing. At first we thought they were one of the bands, but once we got talking to them (us in our broken German, the, in their slightly-better-than-broken English), we found out that they were just a drinking club. Yes, a drinking club. In lederhosen. And the sekt (German sparkling wine) kept flowing. Then this other group of German sat down next to us that all played Foosball (soccer) together. We proceeded to then spend the next few hours drinking and hanging out with them. The dangerous part of this tent is that they pretty much only served wine, in half liter glasses. You could get your drink in two ways - pure or schorle. Aaron opted for the pure since they served a Gurwurtztraminer, but I opted for the schorle (wine with sparkling water, very refreshing! ), which turned out to be the wiser choice for obvious reasons. It was a after a couple hours of drinking, dancing and hanging out with our new German friends that we decided we should probably head home - and realized that we hadn't eaten since the Kurbismarkt earlier in the day. The ride home was interesting, but we made it! Germans know how to have fun. German know how to drink. Anyone else hanging out at wine festivals this weekend? Eating pumpkin to celebrate the impending arrival of fall?